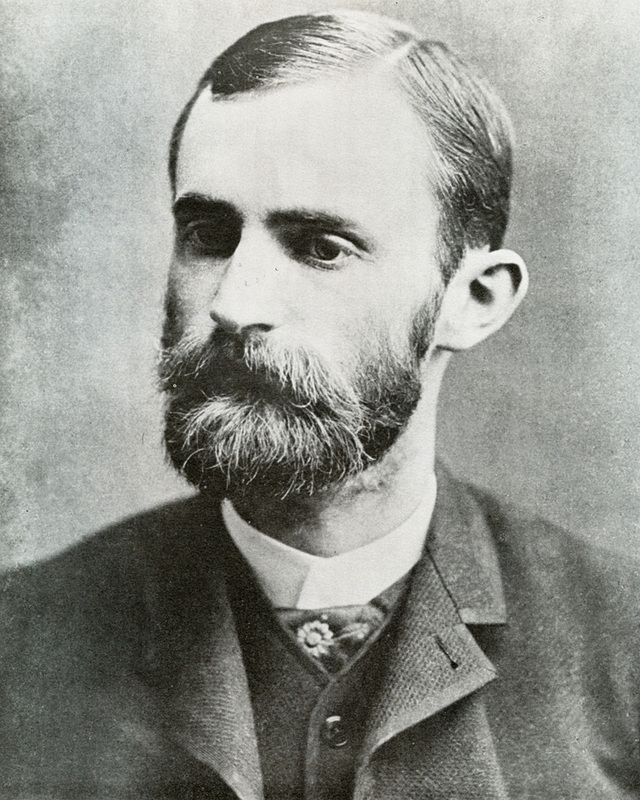 George Eastman, as almost anyone at all interested in the history of photography knows, was the founder of Kodak, and is regarded as the person who brought photography to the masses. He was an early contributor to the development of dry-plate photography (before which creating a photograph was a much more cumbersome affair, requiring essentially carrying around a darkroom, along with some fairly specialized knowledge of chemistry, etc.) and in 1885 created the first paper film negative. He followed that in 1888 with the first roll film camera, and the rest is…well, one writer has estimated that there have been about 3.5 trillion photos taken to date. 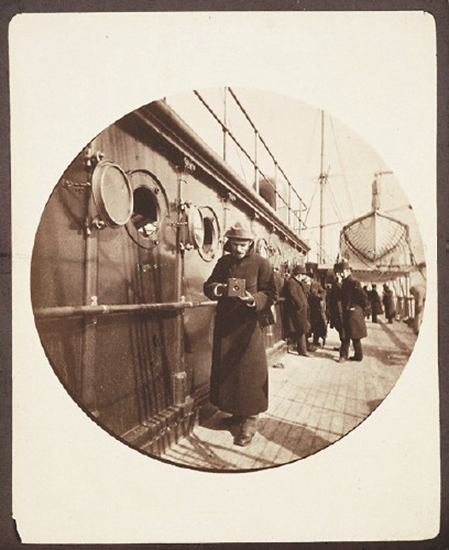 Eastman did not make the trip, but his interest in photography was sparked. After a further experience in which some of his chemicals spilled and ruined his packed clothes during a trip to Mackinac Island in Lake Huron, he became even less enamored of wet-plate photography. Then one day he read about photographers in the UK making their own gelatin emulsions (which remained sensitive to light while dry, thus doing away with much of the inconvenience of the wet-plate process). He threw himself headlong into working on his own formula – some nights, according to his mother, sleeping on the floor next to the stove, so tired that he couldn’t undress. And they really did. The cameras came loaded with enough film for 100 exposures, after which the photgrapher would return the camera to the factory. The film was then processed and the camera reloaded and sent back. The resulting shots were 2 1/2″ in diameter and round. 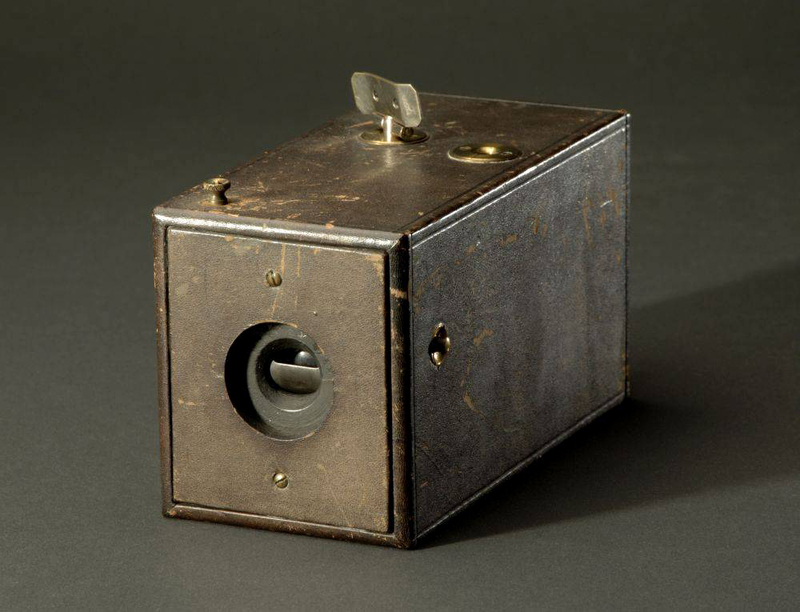 The very first camera, produced in 1888, was simply called The Kodak. 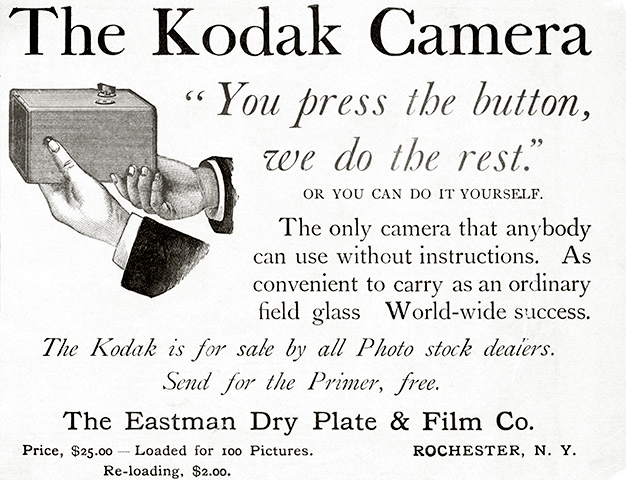 The model with the name that makes it seem like it was Eastman’s original effort, Kodak No. 1 (also commonly called the No. 1 Kodak), actually was the company’s second camera, and was produced from 1889 to 1895. It featured a more reliable shutter as well as an easily removable lensboard rather than one held in place by screws. The cameras cost $25, which today would be somewhere in the vicinity of $600. Eastman was an intriguing character, both in his early years and then later in life, and I will of course delve more into his story in future posts.